304 - thanoscardgamess jimdo page! 304 (pronounced 'three nought four') is a point-trick card game popular in Sri Lanka and Tamil Nadu and Maharashtra in the Indian sub continent. It is played by four players in fixed partnerships, partners facing each other with a 32-card pack. 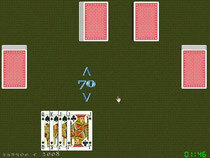 The aim of the game is to win tricks containing valuable cards which give a total of 304 points. There is a bidding phase and the declarer is not revealing the trump suit, unless required by the gameplay.